Rings may traditionally be reserved for the bride and groom, but these days they are taking on a new life as bridesmaid gifts. These customizable wooden accessories were the perfect complement to Krista Oliver and Justin Stringer’s country-chic wedding at the World Forestry Center in Portland. 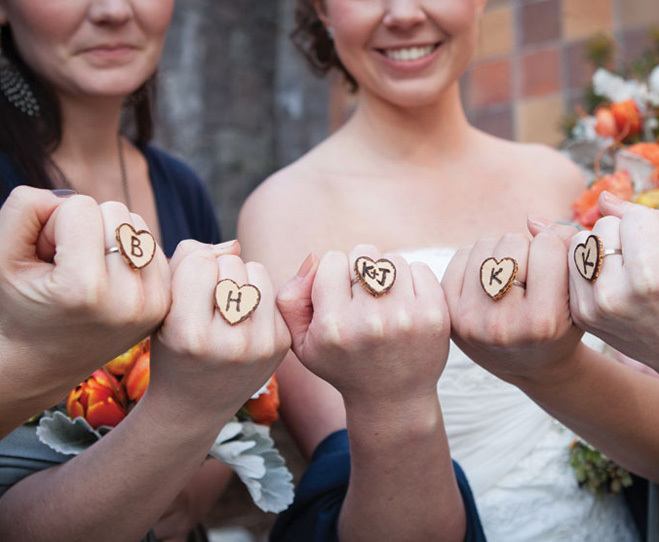 Krista, who handmade many of her wedding’s whimsical details, assembled the rings using materials found at Craft Warehouse and engraved the rings herself using a wood-burning kit. This new twist on the iconic wedding accessory is both creative and classy, with a nod to Oregon’s beloved landscape.